The silence had been broken. The rocket had landed so close, and struck with so much force, that the concussion felt like a Bruce Lee kick to the chest. My ears rang as I dove toward a dusty ditch for cover. My teammates, awakened by the explosion, rushed to setup a 360-degree security perimeter. My rifle aimed into the pitch-black landscape waiting for an invisible enemy to shoot first. As I lay in the canal, I noticed some movement in the periphery of my left-eye. It was a woman in a full burka. She wasn’t supposed to be walking by herself. It was well into Christmas night, and a rocket had just exploded. Yet here she was walking alone, in a Muslim country. These were sure warning signs of trouble to come. She walked nonchalantly and carried an upscale paper shopping bag. It looked as if it were from the Gap, or a similar type of western store. “How was this shopping bag even possibly in this country?”, I thought to myself. I had processed a lifetime of information in the span of a few seconds. “This is where I blow up. This is the one”, I thought. I was no more than 10 feet away from her. My rifle barrel never left her chest. Suddenly, she stopped walking. She bent over at the waist, and gingerly placed the shopping bag by her feet. The woman stared off into the black void as she stood up. Time froze. “This is the one.” Being as quiet as possible, I dropped a round into the chamber of my M-4 rifle, and moved the safety lever to “fire” position. I curled my index finger softly but steadily around the trigger. Squeezing just one more millimeter would mean the end of her life, but it could also save mine. I felt as if time had stopped. I was gripping my rifle so tight, I could see the barrel bobbing up and down with my heartbeat. She was clearly a suicide bomber. It could have happened at any moment…..BOOM! And what if she wasn’t carrying a bomb? What if it was fruit in her bag? The expression “It’s better to be judged by twelve than carried by six” ran through my mind. Despite the training, discipline, camaraderie, combat training, and weapons training, life hung by a millimeter. It was the cliché from every war movie; it was her, or me. It was just another zero-sum game. I did not want to shoot her, but I did not want to die over something as stupid as a suicide bomb. Yelling commands or instructions at her could cause her to detonate the explosives. My team and I were spread too far apart to quietly communicate, and my radio was….somewhere….it was cliché. The woman bent over yet again, but this time, she picked up the bag. She stood up and paused. “This is the one”, I thought. After a moment that seemed like an eternity, she curled her fingers around the handles of the bag and slowly walked away. My rifle never left her chest as she disappeared into the pitch-black distance. She had no idea how close she came to dying that night. To this day I don’t what her intent was. Maybe her bomb malfunctioned. Perhaps she buried it further down the road. Maybe it was fruit after all. I will never know. I am glad I made the right decision. I would later hear Barack Obama say, “Sometimes you have to choose between a disaster and a catastrophe”. And on that day in Afghanistan, I wasn’t judged by twelve nor carried by six. September is again here. Another year of lies and heavy propaganda is ahead of us. Now we are teenagers and now we know. And it hurts. The school year does not start with academic activities. Ceausescu is using us as cheap labor in the field. We go to school only to be picked up by old, dusty, and dirty busses. After an hour or so, we arrive to this farm and we are instructed how to harvest potatoes by digging with our bare hands in the dirt. Surprisingly, it’s kind of fun not because the work is easy (it’s exhausting and we don’t get breaks except for one at lunch), but because we are not in uniforms, we do not see the dictator’s face mounted on classrooms’ walls and on the front page of all textbooks. We do not recite stupid poems; instead, we speak among ourselves. Mind you, not freely. We know we have to be very careful. We have to select our words so we are not targeted as “enemy of the regime.” We have heard of cases before. We are cautious. There is this very poor guy who once tried to smuggle two potatoes, stuffed them in his bag, got caught, slapped, and was humiliated. He wanted to bring two potatoes to his family! I feel sorry for him. But no one says a word. We keep our heads down and the ride back home is painfully silent, as if we did something horrible. The next day, mother gives the school officials a letter claiming I have allergies to dust. My work in the field stops. Another word that did “not” exist was disability. In my class there were at least 5 students who were not able to read and write and talk fluently, but the system had to pass them because we were all the brilliant, vibrant, and patriotic offspring of communism. Plus, intellectuals were not welcomed in communism. Proletarians were, the workforce, the ones who did not have to have opinions and did not care to open a book because exhaustion & routine warped their lives. Growing up with so many lies, can you imagine? There was no reality anymore. It was so light, it was so crushed, it was wiped up, it was bleached, it was violated constantly that we knew otherwise, yet anything that was reported in media had to be presented bombastically differently. From 1965 until 1989, we were lied systematically, brainwashed. Some tried to rebel. They were tortured and they paid with their lives. Some tried to escape as political refugees. If they succeeded, they did not look back. If they didn’t, they were killed. Most of us, kept silent, but the rage was growing exponentially each year. This silence was a heavy load, a bitter taste. How can one resist in a system like this without telling lies? Does integrity still exist in such milieu? Are all political regimes doomed to be corrupted and full of lies? Well, I am not sure anymore. Casey and I come from different backgrounds, there is something in our experiences that overlaps: we have been through historical anomalies that we think we should convert into stories: as a veteran, Casey’s are personal reflections and recollections from war-afflicted zones in Afghanistan; mine are from communist Romania under the dictatorship of Nicolae Ceausescu. Since we have both experienced abnormal episodes of history, we want to make sure others will not (re)live ours, or at least warn them of what we went through so that they would cope better. This is the history/herstory that we need to make and leave behind, and not a standard, impersonal history textbook. Thus, the main goal of our collaborative project is to transfer the events that we experienced into words, to give meaning to our past, to reflect on what can be done further, and to use narratives as therapy. Expectations: We are hopeful that our stores are published in a mini-series/book, online platform; conference presentations; blogs/vlogs; and/or podcasts. Research methods: Dr. Florescu and I will write each other letters. We will then respond to each other attempting to meet in the middle to discuss the ethos, logos, and pathos of surviving. We provide feedback to each other as a consequence of our accumulated experiences and survival skills. It was 2008, and at the height of “the surge”, when there was a concerted effort to increase the American footprint in Iraq and Afghanistan. It was also the year that I enlisted in the Marine Corps. Although I had a cushy office job, my job title might has well have been “lab rat.” I was a cubicle slave in the land of the free. There wasn’t a point in my life where I didn’t want to join the military; it was always my calling. Maybe it was the GI Joe cartoons, or perhaps it was from watching live broadcasts of the first Iraq war (Desert Storm). The surge was an attempt to take back control of what we had lost. Strategically, the war wasn’t going to well for the United States and her NATO allies. We had been actively engaged in the Middle East for nearly 10 years. I was an older Marine, but I was smart and quickly leveraged my 28-year-old wisdom against my younger peers, garnering the respect of my superiors. After a few short months in the Marine Corps I received great news, I had been chosen to deploy to combat. A government sponsored trip to Afghanistan. My boyhood dreams were coming true. This was a huge privilege as there were some who weren’t selected. Part of me knew that this could be a one-way ticket, but that wasn’t of concern. The whole point of joining the Marine Corps is to go to combat and to “get some.” This was what we had trained for. Aside from an unforgettable night in Tijuana, Mexico, I had never been outside of the US. Yet, a few months later, and weighing a combined 300 pounds (between myself and my gear), I boarded a plane for Kandahar, Afghanistan. We made a stop in Sophia, Bulgaria and waited nearly a week in Kyrgyzstan. We filled our time with small talk, and obsessively checking over our gear. Without warning, we “received word” that we were scheduled to depart to Afghanistan. 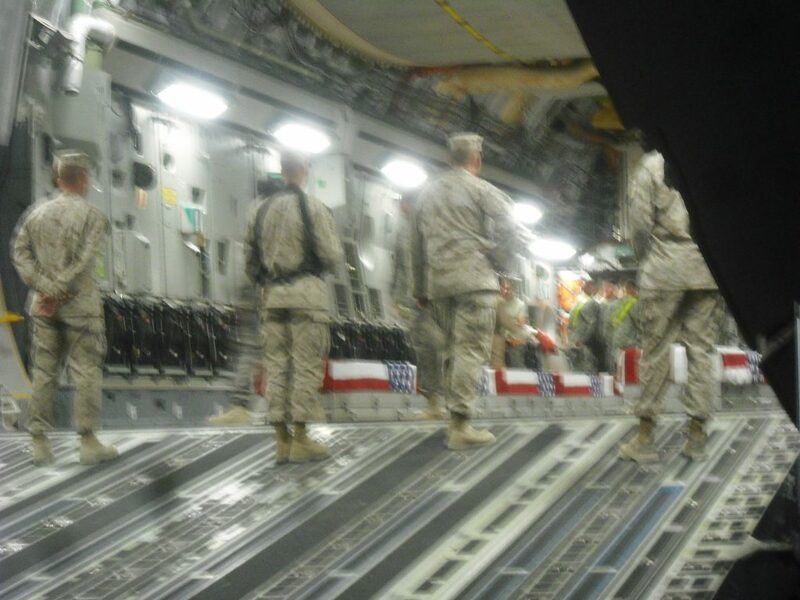 Hours later, and in the still of the night, we boarded massive C-17 transport plane destined for Afghanistan. Emotions were high during the flight. Very few words were spoken. What was there to say? We were literally flying toward people who wanted to behead us. Perhaps we were wondering what in the hell we had gotten ourselves into. My delusions of grandeur had remained in Kyrgyzstan. This was real. I joined the Marine Corps to “help”, but I was immediately aware that war was a zero-sum game. I had become the enemy. These concepts were scattered and fleeting, but there was one thing that immediately brought them into focus –the heat and the moon dust. We landed in Afghanistan and the heat hit me with the intensity of a tsunami, while I drowned in seemingly subatomic dust particles. I can only describe it as walking into an oven. Think of the way your arm feels as you test your cheesecake with a toothpick. Now imagine yourself simultaneously breathing in flour. It was like that. I had been “in country” merely a week when I had my first “come to Jesus” moment. 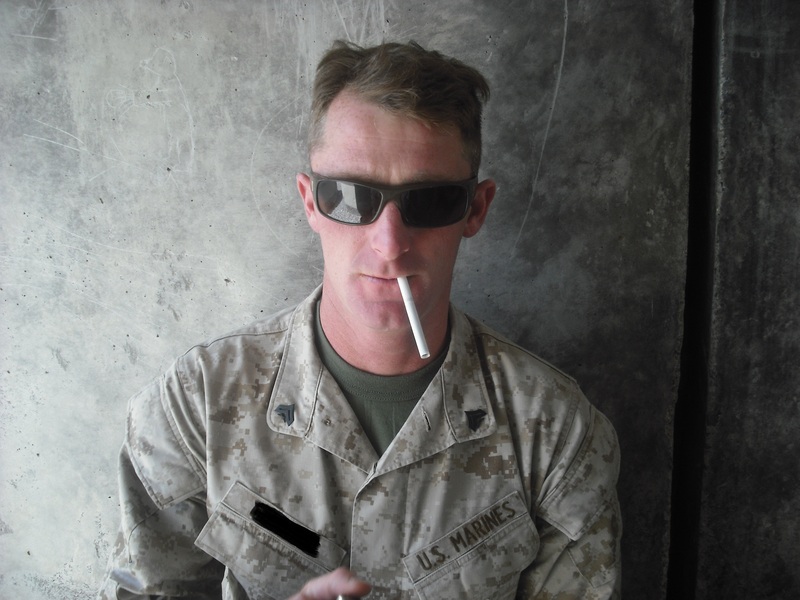 I was outside of my tent, and smoking a cigarette, when two Marines sat down beside me. Although I never spoke to them, these Marines would change my life forever. The memory is so vivid that I can still remember the texture of the light, the colors of the tents and their shoddy patchwork repair jobs, how my fingernails were groomed, and the squeak of the moon dust below my feet. I remember everything about that moment. Since I wasn’t part of their unit, I might has well have been Joe Blow off the street (Marines stick to their own). They were heavily tanned, dirty, and underweight. Although their eyes gazed upon the ground, you could see that they were looking through it. It has been described as “the thousand-yard stare.” They appeared as if they were the lone survivors of a horrific train wreck. Their faces looked disheveled and confused. It was then that I heard a conversation that I will never forget. I will never forget it. I was pretending not to pay attention when one Marine said to the other, “I lost twelve from my platoon.” The other responded, “I lost seven.” These were unimaginably large numbers. They shook their heads in disbelief, and went back to silently staring through the earth. They stole my smile. And it will never return as the smile my Mother remembers. It wasn’t a joke anymore. The fear had finally set in. I wasn’t GI Joe after all. I was just a well-fed, pale-looking person in uniform –a mere mortal. I wasn’t even in Kandahar yet. I hadn’t seen any action. Seven long months lie ahead. When mother told me I had won the first prize at a national painting competition, I was ecstatic. But when she said I would go abroad (knowing how difficult was to do that during communism), I was in a state of shock. It seemed the world made sense again or for the first time. We arrived in Denmark at night and I was okay with that (Ceausescu would cut off our electricity for hours and would do that daily). I was ready to go to sleep, but the streets were inundated by light. Only in Bucharest there was light at night and only in certain parts of the capital. I was not from Bucharest but from a small town by the Danube River and visited the capital very rarely. The whole ride to our hotel was surreal to me/a commonality for the Danes. Everything was great and during the trip something magical happened: communism stopped. I did not have to wait in line for hours to buy bread; I did not have to wait for the weekend to watch cartoons for 5 minutes (and that was not because I had strict parents but because this was all we got); I did not have to wear a uniform that only conflicted with my self and didn’t have to recite poems that made me nauseous; I did not have to see Ceausescu’s face everywhere. But then that happened… the slap, waking me up from a dream that I was living in Denmark. Nobody ever slapped me before. A girl decided to escape: she risked everything and just ran away. Disappeared in seconds. I happened to know her and I was accused of complicity. One of the teachers slapped me. We were about to go to the airport to take the plane back home. I was interrogated then & there. The slap still felt heavy on my cheek as if tattooed. One more interrogation followed at home. You are made to feel guilty. You shake. Nothing makes sense anymore. His dictatorship reaches a new, felt level. If before, you buried it deep down, ignored it best you could, now you feel it. And that’s something you don’t like. At all. Luckily, you are a teenager and memories come and go, are loud and weak, you love, or think you love, and days pass by. Because of Denmark, I discovered hope. Because of the slap, an assertive voice.